Everybody must get … modulated. All of the plug-ins Cableguys make are available with free trials. But now, you can try out that goodness with a completely free effect, sending your listeners’ headphones on a trip with the PanCake audio effect. 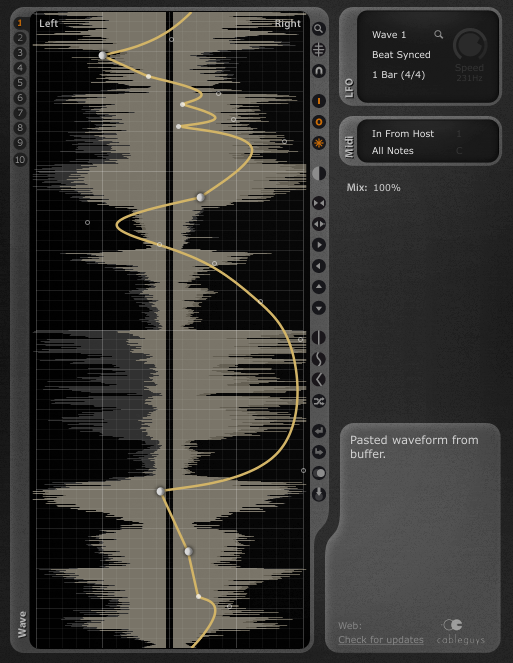 Draw modulation with a variety of curves and edges; store up to ten customized waveforms. LFO, with speed running from 0.02 Hz to 5.24 kHz, or synced to tempo from 1/128 to 32-bar length. LFO syncs with transport and tempo changes. Everything can be automated – even the waveform shape. Now with left/right volume display, LFO triggering via MIDI, new UI. It’s not hard to imagine doing all of your panning this way. And we can dream of other plug-ins going this route. Until other plug-in developers do get this obsessive about automation and curves, of course, we have more stuff from Cableguys. All the stuff is good, but I’m especially fond of MidiShaper. With drag-and-drop ease, MidiShaper is ready to do the kind of modulation you wish your host already did. And it’ll pop right before your favorite plug-in or hardware track. Speaking of what you wish your host did, it’s an especially good companion for Ableton Live, so it’s little wonder that the developers have made extensive tutorials alongside the likes of Cubase and FL Studio. I love the LFO Ableton has added to Live 9 – I’ll talk about that when it’s review time – but if you wish Ableton had done more, here’s your solution. 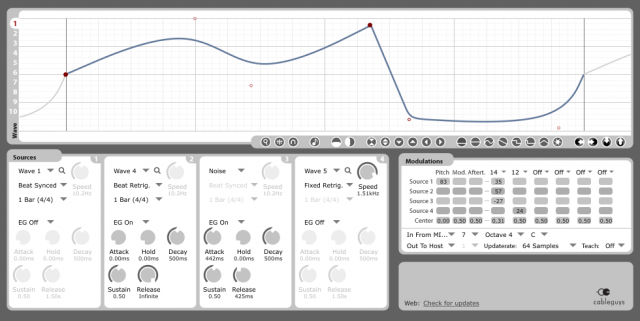 MidiShaper is an LFO, yes. But it’s also a customizable source of modulation of any kind for anything, anywhere. It takes all those lifeless plug-ins and instruments and suddenly grants you omnipotence over all of them, as if your fingers evolved into dozens of pan-dimensional tentacles capable of knob twisting all at once. Yes, it really feels like that. See the video above for an overview. There are various tutorials for Ableton Live, but it’s worth noting that this is useful even with built-in devices – and yes, I’d still use it even though Live 9 now includes the LFO. US$199 / EUR149 with VAT buys you everything. For more free stuff, Computer Music this month has a special version of Curve for free, in issue 188 / March 2013 of the print magazine. Ironically, the cover story is analog warmth – but you can secretly have free fun on your computer with this instead.